Jesus cries and is perturbed, also. Why? No easy answer. This story is a prelude to the cross. It leads the way; it shows us the meaning of Jesus’ coming passion. Lazarus was raised from the dead for a brief respite; Jesus was raised forever. Through Jesus’ death and resurrection we all share in the Lazarus sign. The raising of Lazarus prompts every believer to answer the ultimate question: DO YOU BELIEVE THAT I AM THE RESURRECTION AND THE LIFE? What do you think of Thomas’ statement: “Let us go to die with him.” (verse 16) It is in John 20: 24-29 we also see Thomas after the Resurrection. From that story he gets the name, doubting Thomas. Aren’t we like Thomas, at times?! Martha is worried about the stench in the cave when Jesus approaches (as, of course, Martha would!). Jesus waves that off and focuses on why he is there, “Did I not tell you that if you believe you will see the glory of God?” Jesus is not afraid to come to our stinky, dark places and breathe new life into us! And actually, Jesus does not go into the cave but calls Lazarus out. Jesus calls us OUT of ourselves. And he calls others in to help Lazarus with the bandages. We need the support of our community to jump in and be there with us. Jesus is in the midst of it all. Do you see yourself in this? Our church? The story of the Woman at the Well is a fascinating case study of Jesus and a strong, sinful woman to whom he brings faith. Its fast dialogue and intriguing details make it unique. But we should not let this woman have the encounter to herself. 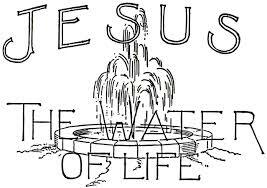 I think we should place ourselves at the well, meet Jesus and deepen our faith. My family and I go camping a lot. The best part is at the end of the day when we have a fire and cook s’mores. My husband Chris taught our kids to hold their marshmallows just over the fire so they toast into warm, brown, sugary heaven. I prefer to burn mine. I like the whole marshmallow to be burned to a crisp. I blow it out, strip the marshmallow of its blackened skin and then burn it again. I get sticky, ash-y remains in the corners of my mouth. I love it. Now that it’s Lent, we are reminded of ashes. Usually there is a more somber tone with Lenten ashes than marshmallow ones. Ashes to ashes and dust to dust, and all that. Job in the Bible was a big fan of ashes; he liked to sit in them and lament his woes. Maybe ashes don’t have to be all about suffering and sadness, though. Ashes do have a hope about them…a soft sweetness. Ashes are transformative. Whatever the thing was before is now changed. The thing isn’t what it was and cannot go back; it has a new reality. Ashes can be good. They nourish the soil. Sometimes fields are purposefully burned to bring new life to them. I know I prefer an ashen marshmallow way more than a fresh one. It has a deeper, sooty taste. Maybe the bitterness balances the sweet. Ronald Rolheiser says some Aboriginal communities had a tradition where a person would need to spend time sitting in the ashes. It was healing. It was work for the soul. 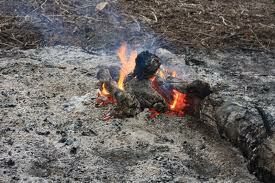 After taking this time in the ashes, the person would wash them off and return to the routine of their life, refreshed. Even if not refreshed, then changed in some way. Transformed. It feels like a lot of people I know are struggling lately. Bad things happen – and just when you think you can’t take another thing – another bad thing happens. It’s like being covered in ashes. Sometimes, all we can do is just sit in them for a while. And when we are ready, with God’s help, we can wash them off and be changed by them. Transformed. I’m not saying we should go looking for a pile of ashes to jump into. Ashes, like all suffering, seem to find us. I just wonder if it’s okay to be in them sometimes. And when we are, we could grow and be re-made from the experience. Like fire to a marshmallow, maybe we’ll be even better afterwards. What do you think? I am sick of this winter. And it is more than about a meteorological phenomenon. It has affected my attitude and I bet it has affected yours as well. It has been a keep your head down, get through the icy wind kind of winter. Yes, there are occasionally pleasant spring-like days just to tease us. They come as shafts of light angling into a basement. But then the cold reality returns. And I think that it is often enough that way in our lives. We keep our head down and try to get things done. Try to keep up with our calendars, our deadlines and our homework. Occasionally, some light shines through, a moment of levity are a clear possession of beauty, but then it is back to the grind. *The wedding at Cana – Jesus changes the purification water into wine. Jesus goes to Jerusalem and cleanses the Temple. Nicodemus, a faithful Jew and Pharisee, comes to Jesus at night discovering that he must be born again of water and Spirit. John the Baptist tells followers that Jesus must become more important, and he must become less. All of these ‘signs’ reveal to us that in Jesus a new way is open to relate to God – to a God who loves us and wishes to be one with us. +Jesus is thirsty – he is human and in need. Perhaps the human Jesus also speaks to us of God’s thirst as he begins an encounter with this woman. For what or whom do you think the God-in-Jesus ‘thirsts’? +This story was a very important one for early Christians – especially as they prepared people for baptism. his ability and courage to breakdown barriers. While we celebrate St. Patrick with music, dancing, corned beef, cabbage and beer, it’s good to know the conversion of body and soul that marked the teenaged Patrick forever as a follower of Christ. Then one night at the family estate, he was awakened by pirates who bound, gagged, and kidnapped him to be sold as a slave across the sea in Ireland. His new master needed a shepherd to spend hours on a cold, rainy or snowy hillside. The boy was fed just enough to survive. The cold and loneliness of his new life brought tears and trembling. Patrick fasted as a way to come closer to God. He sang psalms and prayers he’d learned in childhood – 100 each morning and again each evening, yearning to reach God’s ear. One night, after 6 long years, he heard in his sleep, “You are doing right by fasting. Soon you will be on your way back to your home country.” He awoke full of hope. He did find his way home and began studies for the priesthood. Years later he heard a different dream-like voice asking, “Holy Boy, come back to us.” As one, the Irish people were summoning him back to share his faith. He had learned of forgiveness and desired nothing more than to return to teach about God the Father, God’s son, and the Holy Spirit who had been his guide. Great lessons for Lent, whatever your age. Freeman, Philip. ST. Patrick of Ireland: A Biography. New York: Simon & Schuster, 2004. 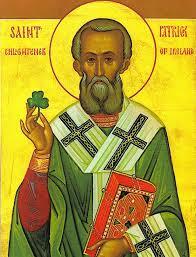 McCormack, C M. St Patrick: The Real Story as Told in His Own Words. Dublin: Columba Press, 2008. 1. Name your deaths (Good Friday). 2. Claim your births (Easter). 3. Grieve what you have lost and adjust to the new reality (the 40 days after Easter). 4. Do not cling to the old; let it ascend and give you its blessing (Ascension). This is the theme of Lent for us at our parish this year. What a beautiful thought – to open the door and allow Christ to enter into our lives. It’s a brave thought. It takes guts to put ourselves out there and see what happens. And that’s exactly what our catechumens are doing. Being brave. Meet Jessica, Chris and Jason. It you see them in church, say hi! They have been going to RCIA sessions (Rite of Christian Initiation for Adults, or the process of being baptized and confirmed into the Catholic church as an adult) every week, learning about this faith of ours. They’ve had lots of questions, and lots of their own insights. They’ve been journal-ing personal reflections on the topics we cover. This journey is personal. 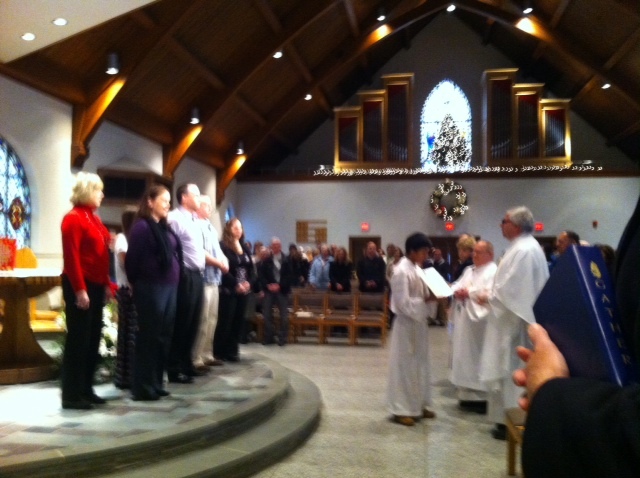 They are creating their own friendships with God, and we are blessed as a parish to witness it (I apologize for the blurry picture; this is when they were first welcomed at Mass in January.). They are opening themselves to Christ. In the fall, they had no idea what lay before them. They had a desire. They wanted something more in their lives. They wanted to find more meaning. Doesn’t Christ lead us to all of this? He does when we allow Him – when we are open to it – which is what they are doing. They are an example for all of us. It’s funny that those who are just beginning to understand the mysteries of our faith could be the example for us who may be “weathered” Catholics. I went through the RCIA process myself 19 years ago, but every session we meet I learn something new or see something in a new way. We never have it all figured out. Christ calls us deeper and deeper into relationship with Him. If you are interested in being baptized and/or confirmed as an adult yourself, or if you would like to know more about this wonderful faith of ours, please ask for me in the parish office. I’d love to chat with you. Be brave, and open yourself to Christ! “Do not worry about your life.” “Can any of you by worrying add a single moment to your life-span?” “Do not worry about tomorrow; tomorrow will take care of itself.” Aren’t those wonderful and comforting words from Jesus? Wouldn’t it be nice if we believed them?